As the credits roll, there is a deadly silence in Screen One. Normally, elderly Bath ladies can be heard reminding their husbands about the parking meter, or muttering about the price-of-things-today. I can’t sit there any longer and dash to the ladies toilet in the foyer. I’ve run out of tissues and need some loo roll to wipe my eyes and my runny nose. I’ve just spent the majority of my time, watching I, Daniel Blake by Ken Loach in silent floods of tears. It was a very moving film for me. I’ve also been a single Mum, but only to one child. I’ve also had to sign-on when I instantly lost my job as a retail manager many years ago. The memory of standing in line, explaining myself and my financial situation to a complete stranger at the dole office who had just told me I wasn’t entitled to any money for 13 weeks while my child asked me: ‘Why are you crying Mummy?’ hasn’t left my mind. Those ghastly memories flood back and make me so grateful that will never ever, ever happen again because I’m self-employed with no boss to sack me. So who was the person that directed this film? A Sunday Telegraph headline on the 8-1-19674 was titled ‘Stop Mixing TV Fact and Fiction’ but the film made such an impact, that criticism is now rarely heard. We don’t have a birth time for Ken, even though I did tweet and ask. Maybe he or his staff don’t read his tweets. Never mind, we definitely have his date of birth and using the Whole Sign House system we can find out quite a bit! Ken has a Grand Cross in mutable signs, wanting change and variety. Mutable signs tend to live in the past, so are usually good at remembering ‘how-things-were’. Jupiter retrograde in Sagittarius (interestingly the only retrograde planet in his chart) brings him an international network of professional contacts. His Saturn in Pisces has a desire to improve the situation of the underprivileged. And his Neptune in Virgo suggests interest in improving work conditions and idealistic projects that can rouse the working spirit, motivated by the idea of service on a personal or political or level. With that amount of Gemini in his chart, he’s not likely to want to do anything too boring or repetitive. His Pluto in Cancer sometimes has a fanatical patriotism and desire for the state to take over the function of the family. And his Uranus in Taurus suggests alternatives to material security and untraditional ideas about money. Jeremy was born in Chippenham on the 26th May 1949. While still at school he became active in his local Labour party and the League Against Cruel Sports. In 1966, the year that Cathy Come Home was broadcast he joined The Campaign for Nuclear Disarmament and in October 2015 became one of their vice-chairs5 He left school at 18, briefly became a reporter at 19 and went overseas for two years with the VSO. He had various jobs within certain Trade Unions and the Labour Party until February 1982 when he was elected Labour Party candidate for the constituency of Islington North. On the 9th June 1983 he was elected Member of Parliament for Islington North in the General Election that year. Fast forward to today which sees him as leader of the Labour Party. His chart shape is a Bucket with Jupiter retrograde in Aquarius forming the handle of his bucket, giving him weird and wonderful ideas about freedom and belief. Jeremy has a Yod linking his Jupiter in Aquarius retrograde hinting at unusual humanitarian goals, Saturn in Leo bringing strong ideas about leadership and Uranus in Gemini ensuring upheaval and renewal in education and ideas. He also has a Grand Trine in Air signs = It’s All About Ideas. He has Mercury, Jupiter and Neptune retrograde so one does wonder if his grip on reality will work for or against him in his political future. His Pluto also in Leo brings strong personal convictions and principles. He has been married three times (not an unusual Gemini trait). Aspects are Moon conjunct Mars, maybe that’s where the angry-young-man in his youth comes from and Moon square Pluto = social conscience. Both men have Mars issues. I’m a regular Astrologer. I work in private practice in the UK and I am also a qualified Homeopath and Hypnotherapist. This is amazingly interesting, as the clients that I see and treat have the (if they want to) added advantage of me being able to construct their chart and find ways to help them more. This article is about pain. There is a lot of it about. I have been observing the painful issues my clients have had since I went into private practice. My husband, who is trained in that wonderful Mind-Body resource: Hypnotherapy. In fact he has more Hypno qualifications than me. He’s retired now and works part time as an artist, doing pet, aviation and maritime portraits. 7 weeks ago he had an awful, painful episode that simple healing and painkillers just wouldn’t do anything for. He went to the doctors about 5 or 6 times, and the local hospital. He was prescribed an amazing array of painkillers and sleeping tablets, all of which affected him in other ways. Some made him sleepy during the day. Others upset his digestion. One of them made him worse…nothing seemed to be helping. I knew he hadn’t had an accident. I knew that there wasn’t anything that he’d ‘done’ that was the cause of the pain, but he was home-bound, chair bound, couldn’t walk…he was so unsteady on his feet I had to buy him a walking stick from the charity shop. He couldn’t sleep lying down and got some sleep sitting up with the sofa cushion behind him and lots of pillows. Eventually when conventional medicine wasn’t doing much to help, he went to see my homeopath and also for some counselling. Now he’s out of pain and is getting better. And there is something going on in his chart that as a non-astrologer, he’s not that interested in, but I am. He’s having a Saturn~ Moon transit. I’m not going to explain too much about Astrology in this article, just enough to help you understand what I meant by the above. We all have a thing called a Birth chart. This is an Astrological calculation based on the location and position of the planets in our solar system on the day you were born. Imagine a birth chart as being a little like your hand-prints. It records everything to do with your ‘self’. One hand is a record of all the potential you were born with. The other represents what’s likely to happen to you in the future…because of your potential. 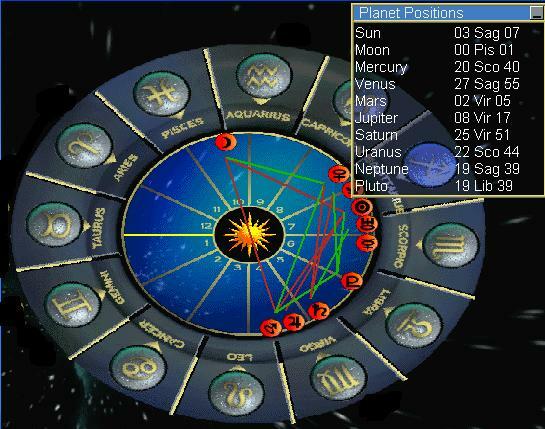 An Astrological birth chart records and uses the position of the planets on your day, time and location of birth, as if you were looking up at the sky on that date. I suppose I’ve been doing Astrology for so long now I don’t have to think about why and what everything in Astrology does or is for. 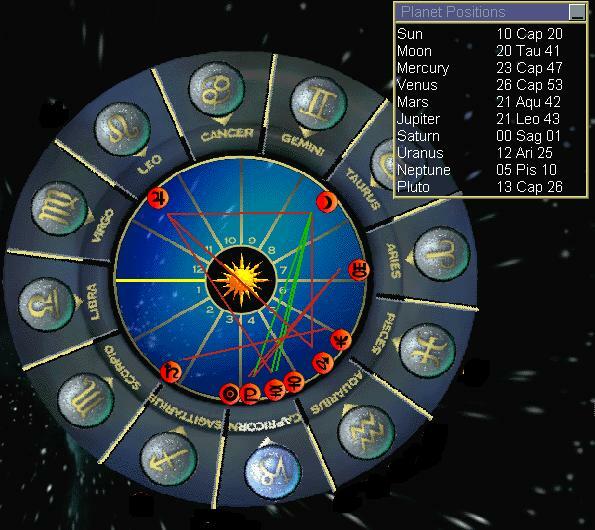 A correctly calculated birth chart is the missing link to understanding each human in the world. It would be lovely if every child had their chart made at birth and their parents would then know how to parent them….but I digress. This birth chart thingie shows what your health is like, and what might be helping or hindering it. These are the planets that are visible to the naked eye and ones the ancient astrologers used. Meaning what happens in the sky is reflected in what happens here on Earth. Now, after hundreds of years worth of observation various attributes were ascribed to these planets. These are the ones I have noticed are more likely to be aligned with issues in your life to do with pain. Now, in a chart the Sun represents who you are. The ego bit of you. The bit that you’re conscious of. The Moon, which in reality reflects the light of the Sun, represents the unconscious part of you, that bit that you sometimes tune-into when you’re feeling emotional. Now when I mentioned a transit earlier, what I meant was when a planet TODAY, travels past a part of your birth chart it can trigger off certain positive or negative happenings either for you, or to you. They don’t directly affect you…not in anyway you could record. I couldn’t measure with any precise instrument that those planets were sending rays of light or energy to you…I don’t know ‘how’ it works. All I know is it does. I’ll leave that to someone else to investigate! So, when Saturn makes a transit to something in your chart, you’ll sure know ALL about it. When Saturn transited my Sun-in Pisces my ex-husband left me for another woman. And I’d recently given birth, so it wasn’t an especially happy time for me. Now (25th March 2017) Saturn is in the sign of Sagittarius. It takes 28-30 years to go all the way round the Zodiac…so when it’s in a sign it’s usually there for about 2 years. Over the next few days and posts, I’m going to use the charts of 6 kind volunteers to explain exactly what I’m talking about. Kate has had a terrible diagnosis and a long amount of time suffering pain. She says: Pain is worst in my lower back, T10-L3, where there is significant nerve damage due to Transverse Myelitis, but also have generic widespread pain due to Multiple Sclerosis. I’ve lived in pain a while, but it got worse April 2014. My date of diagnosis for both conditions was 29th April 2014. Here is her transit chart for the actual date she got her diagnosis. There is quite a lot going on. First up Saturn has transited from the sign of Virgo in her birth chart to the sign of Scorpio and it conjunct (next to) her Mercury, the planet of thinking, thought and communication. On the day of her diagnosis, The Sun, Moon and Mercury are slap bang on her Ascendant in Taurus. Double Whammy, not going to forget THAT too quickly. She’s also spent a life-time under the influence of Pluto. Pluto was in Libra when she was born, it’s now in the sign of Capricorn. …now look at Neptune’s transit. It was in the sign of Sagi when she was born and natally it’s right next door to her Sun sign = someone who is VERY sensitive/psychic. Now it’s right on her Moon in Pisces, so for the whole of her life it hasn’t transited much (just her Venus soon after she was born) now it’s aspecting her Moon= her emotions….making her FAR more sensitive than ever. So maybe, things like weather or noise or other people’s emotions will upset her and make her symptoms worse. So, because of these transits, Kate has ‘suffered’ a period of pain. It doesn’t mean she’ll suffer forever, just that it reflects very accurately what’s happening with the planets and luckily everything will eventually move, and she will find relief. I don’t generally write about Astrological events that aren’t personal, but in this blog post I’m going to share with you some thoughts about Pluto and Uranus. I’ve been following (who hasn’t) the US general election. I don’t find politics that interesting, there’s nothing I can do other than vote…and hope. There is lots of on-line discussion about the various candidates of the US election but I’m not going to discuss them personally. c) They don’t have anything to do with this post. This post is about the transits of Uranus and Pluto. I have a big fondness for Uranus as it was discovered by an amateur astronomer in the city of Bath where I live. At the moment it’s transiting through the sign of Aries. I don’t think it’s particularly happy in the sign of Aries. Aries is all about ‘the self’ and Uranus is all about freedom, so you’d think they’d make a good match. Uranus is all about freedom and when it transits through a sign that is all about ‘me’ then the feeling is that this freedom only results in selfish thoughts. A much less progressive energy. So, when people ask me (and they do) what’s going on Astrologically at the moment, I can only go back in time, not in my lifetime I might add! !…to lifetimes a long time ago. So, I spent a few hours making charts for the inaugurations of US presidents to see if there was anything astrological to explain what might be happening now. Keep in mind, what’s happening now astrologically hasn’t happened in exactly the same way before, but what we do know is about the energies and stories of these planets and how they react and work in each sign they go into. These are the people that actually organise the ceremonies so one would expect the dates and times they record are as accurate as you can get. I was wondering about the charts for those dates and here they are….what I was looking for was what happened the last time Uranus and Pluto was either conjunct, opposition or square, which is what it is at the moment. While I was working through the charts of all the inaugurations I noticed that when there was a Yod or inconjunct formation for that date, some of the presidents came to an unhappy end. These are the charts for those president’s inaugurations. 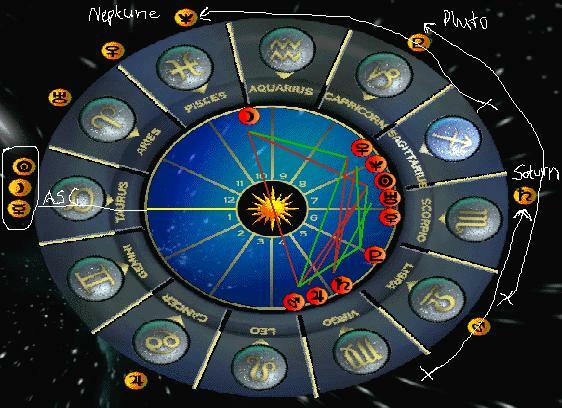 William McKinely William’s natal chart Sun and Moon Aquarius was the first president to have his inauguration organised by the Joint Congressional Committee on Inaugural Ceremonies. There isn’t a Yod in this chart, but there is an inconjunct. Saturn and Jupiter are in Capricorn, with Saturn inconjunct Pluto. The Sun is in the 9th house of belief, long-distance travel and philosophy. Fine attributes for a president signing-in chart to have. Pluto and Uranus are in opposite signs of Gemini and Sagittarius. There are a lot of oppositions. Sun opposition Moon being the most significant. Ego v.s feelings. He was sworn in just 2 hours and 8 minutes after John F. Kennedy was assassinated in Dallas. Another Yod linking the Pluto/Uranus conjunction, The Moon and Jupiter=connections between power and freedom, emotions and beliefs. The Moon is in Aquarius which is a more cerebral sign. He only survived 4 or so years after he came out of office. No Yods but an inconjunct between Saturn and Neptune. Moon is just to the end of Scorpio in the 7th house of relationships and marriage. Sun is conjunct Jupiter in the 9th, a happy placement for Jupiter…and the Sun is a few minutes into Aquarius, the Ascendant sign of Mr Obama. Still some oppositions. Saturn opposition Venus and Uranus. Pluto is in Capricorn and Uranus is in Pisces, so they’re getting along with each other very nicely. Nothing especially challenging. Moon and Jupiter are in Gemini, which Mr Obama has in his natal chart. Pluto and Uranus are now square to each other. In William’s inaug date they were in opposition, with Kennedy they were travelling towards a conjunction and now they’re square. All of these aspects are what Astrologers call ‘challenging’. Looks like Obama got out alive and all in one piece…no inconjuncts or Yods. Everything is either square, or opposition. That Pluto Uranus square doesn’t look peaceful or diplomatic! Sun square Moon and Jupiter too; Ego challenges feelings and beliefs. And Jupiter opposition Uranus forming a T-Square with Pluto….all rather challenging and unhappy…Note also that all the planets are on one side of the circle, so there is a very one-sided attitude towards issues…and the Moon is in Scorpio=deeply-felt destructive feelings. There are other inconjuncts with other presidents who died in office, but as this article is about the Pluto Uranus transits, I won’t add them here. What’s important is Trump in himself is not really the enemy. What he’s working with is the energies of two very powerful planets. He’s obviously projecting onto the populus his feelings but he’s not making any friends by doing that. It’s ourselves that need to change, and our thinking processes, not the politics, not the leaders. It’s how we think. If we think that all of these people have power-over-us (Pluto) then we are bending to Pluto’s destructiveness. If we think that it’s us, as the group of wo/mankind that really has all the power, then we release ourselves from Pluto’s grip. What we also need to do is not be so freedom orientated with Aries in Uranus urging us to ‘just-do-our-thing’ that we forget that we are ALL human-beings. I have so many people ask me about their charts and ‘how-things-might-turn-out’ that I thought I’d do the kindest thing and release some weekly podcasts on Astrology. Podcasting is a simple way to listen at your own leisure to FREE information. It means you can listen on your phone or computer, anytime that’s convenient to you…without getting distracted by pictures or videos. If you subscribe, you’ll receive each episode/lesson FREE every week as it’s broadcast and you can listen-back anytime you like. In the first lesson I suggest you make a FREE account at http://www.astro.com so you can start, right away making charts and learning about YOUR chart shape. I hope you enjoy my podcasts and I look forward to spending 2017 helping you learn Astrological basics. Make 2017 the Year You Learn Astrology and Discover your Secret Talents!! The WordPress.com stats helper monkeys prepared a 2015 annual report for Mary’s blog. So, there you are…you’re friends with a Sagittarius…now what? Seems a fitting enough interest for someone with a Scorpio Ascendant and Scorpio Moon to me…and by the time he was 23 he was doing telepathy for small audiences in Israel…fast forward to today. This is different from just believing…you can believe I’m a human being and you’d be right…but you wouldn’t believe-in Astrology unless you’d used it somehow. Little Johnny gets home from school, covered in mud and with holes in his trousers. He tells you that he went to play football after school with his friends and he ‘ accidentally’ fell in the mud. You believe him, you know that what he’s saying matches with some sort of truth as you can see the mud, the holes in the knees of his trousers where he fell over…it makes sense. This is not believing in Johnny, it’s just straight belief. Now, why would Uri want you to believe in him as opposed to just plain believe? Because each Sagi is ruled by a planet called Jupiter, that massive gas giant that is part of our solar system. And what does Jupiter have to do with Sagi. The Astrological description of Jupiter is similar to its astronomical properties, in that it magnifies things, makes them bigger, adds gas to things, builds them up…is BIG BIG BIG…these are all Sagi characteristics. They are inspired individuals. They love a challenge. Love to travel and see/meet other cultures. In our little example Uri has travelled all over the world..and he doesn’t want to just be remembered as ‘the man that bent spoons’ he wants you to be ” amazed, mesmerized,motivated, enthusiastic, revitalised and with a much improved positive mental attitude, state of mind and self-belief.” after you have been to his seminars, or met him in person.